I've been busy getting the next pattern series ready for you but I decided to play a bit more with the tree before publishing a pattern. I've always wanted to crochet a little tree but I really want to make a pattern that is not only fun to make but super fun to play with! I started out with a pretty plain tree, short with nothing really going for it aside from the ruffled green parts. It could hold 3 of the tiny amigurumi bears inside, (pattern to come). See the introduction of it here. The little bear went inside her tree for she was now very tired. She told the frog, the koala and the owl that they could sleep in her tree too if they wanted to, there was room for them all! The koala and frog said thank you to the bear and climbed up into the tree. The owl preferred to stay out on the branch for the night, she was not tired. The owl promised to watch over them while they slept. She said, "Goodnight my friends"
Today I was looking it over and decided it needed some bark. It was still a bit too plain. be written up and published, (I will announce when its ready). 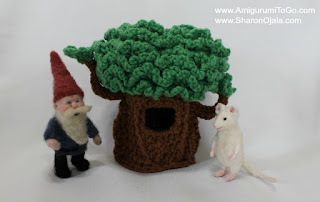 As soon as I finished adding the bark Gnomey and his little mouse Abigail came to visit the tree. Gnomey laughed and thought it was a cute little tree, even if it was made of yarn! Abigail climbed into the tree and giggled as she looked out through the knot hole. She said to Gnomey, "Come inside! There's room for you too!" Gnomey and Abigail are characters I made for my other blog. Follow their story and other characters I've made for the dollhouse here. I also have a facebook page for that blog right here. I hope to see you there! Your tree is lovely for storytelling to little children, while they are playing with the tree, the little big ear animals and otther characters. I love these designs. I'm glad you like the set. 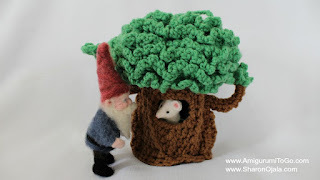 However, Gnomey and Abigail are not crochet. The gnome is needle felt. The mouse is clay and flocking. I provided a link to follow their story on my other blog at the bottom of the post but there is no pattern for them, sorry! There are a series of tiny animals that go with the tree though, I believe I put links to them all at the top or at the bottom of the tree pattern page. If you could discover a way to stop and ask every targeted visitor why they're leaving your website and they'd give you a reply, would you be interested ?